Postcards had appeal for both hometown residents and tourists. Postcards made it easy for people to send a familiar or exotic image to their friends, accompanied by a short note in the space provided on the front and/or back of the card. Popular Rock Island cards usually featured parks, scenic views, riverboats, or downtown buildings and streetscapes. The scene on today’s postcard, however, is not typical of those cards. It’s called a “real photo” postcard and it’s from the collection of historic postcards in the Rock Island Public Library. Unlike most postcards, this card is an actual photo rather than a colored lithograph, and certainly wouldn’t have been purchased by most tourists. The card was never mailed and is identified only as 1601 25th Street. Based on the woman’s “Gibson girl” hairdo and leg-o-mutton shirtwaist sleeves, it dates to the first decade of the 20th century. 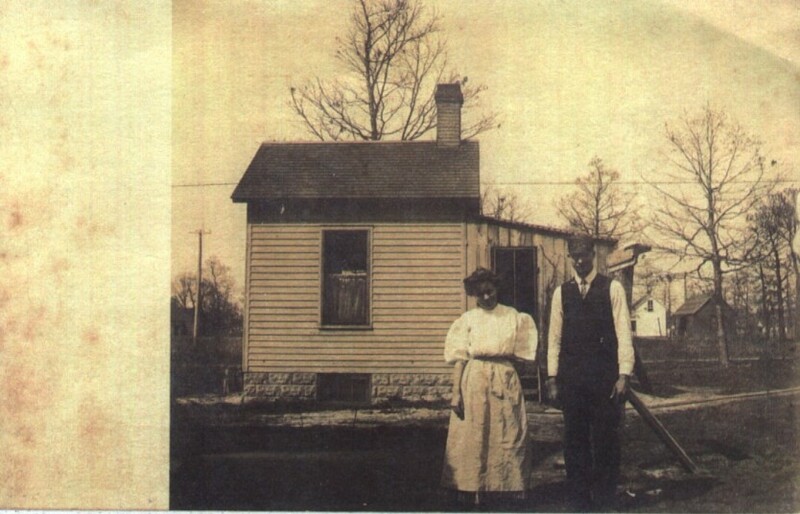 The photo was likely taken just after the house was built, since city directories indicate a construction date of about 1908. The first listed residents were Harry and Mamie Kluge, who perhaps are the couple in our picture. Mr. Kluge was a driver, first for the streetcar company and later for the Math Bakery and Confectionery. The lady wears a long apron over her skirt and is attractively groomed. The gentleman has a tie and vest displaying his watch chain, but wears no jacket, even though the barren trees indicate a late fall or winter date. The focus of the card is the house. Notice how the pair is carefully positioned far enough away from the house to ensure that the entire structure is included in the picture. The front of the house is neatly finished with a foundation of rock-textured concrete block and carefully applied clapboard siding. Even the chimney is nicely embellished at the top. The gathered curtain in the window indicates the house is occupied, although the rear addition appears to be only roughly finished with streaky vertical siding and open-backed steps. Other buildings visible in the distance show the semi-rural character of this developing hilltop neighborhood. The Kluges lived here only a couple of years, then moved to a “30th Street, South Rock Island” address. Directories list many different occupants in ensuing years, indicating that the house may have been rented. By 1920, Henry and Clara Kroeger moved into the home. Mr. Kroeger was a carpenter, and likely he was the person responsible for greatly enlarging the tiny house with a 1½ story addition at the rear and a big porch in front. The chimney remained in the same spot, however. The house must have accommodated the family well, as the Kroegers remained here for fifty years. The Kroeger family remained a strong presence in this neighborhood through the 1990s, as Henry and Clara’s married daughter Margaret lived next door at 1603 25th Street. More recent owners expanded our pictured house even more and changed the original siding as well. As noted earlier, this is not a typical postcard. According to the July/August 2000 issue of Old House Journal, “real photo” postcards were popular between 1902 and 1910. During those years, Kodak made a preprinted postcard backing that allowed photographers to print relatively small quantities of postcards directly from their negatives. This created a new business, where traveling photographers went from town to town to create and sell postcards. Many of these postcards show homes; others are of street scenes and public buildings, especially from towns that were too small to provide an adequate market for lithographed cards. Unfortunately the locations of many of these real photo cards, especially those produced for homeowners, are not identified. Not only is the street address frequently unknown, even the city of origin may be difficult or impossible to determine. When present, postmarks can be an aid in such identification. In the pre-digital (and even pre-camera for many) era, real photo postcards allowed images of prized buildings to be created and shared. This was a wonderful way for homeowners (or renters) and businessmen to show pride in their building. Surviving cards are now a valuable resource for architectural and community historians and can be a source of enjoyment for us all. This article by Diane Oestreich, slightly modified, originally appeared in the Rock Island Argus and Moline Dispatch on June 10, 2001.